This post is Part Three in a series on the brain and consciousness. For more on the specifics of each level, including what is happening in the brain, see Part One and Part Two. 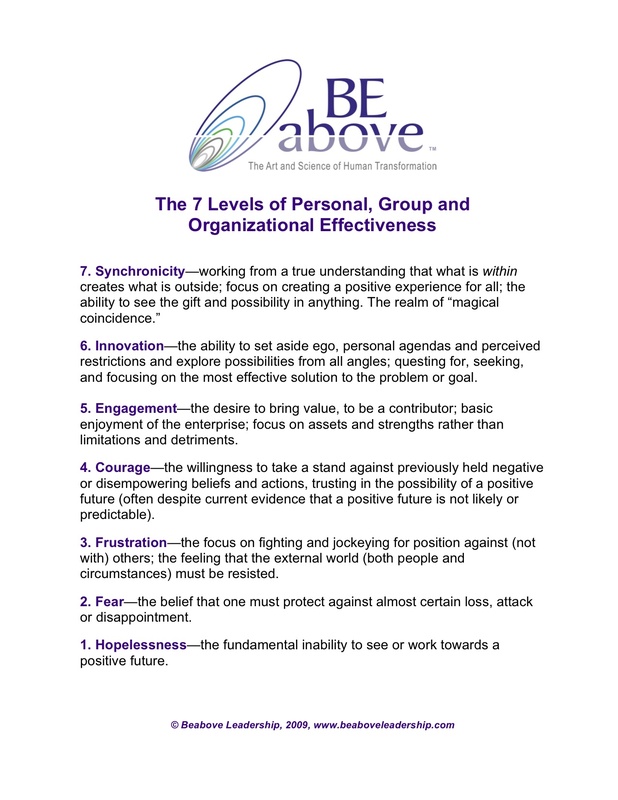 For a complete overview of the Seven Levels of Effectiveness, Click Here. I can’t; what’s the point; yeah but; you don’t understand; that won’t work; I’m worthless; resigned/passive victimhood; unable to see ANY other perspective. Saboteur voice is so loud client cannot differentiate saboteur from self. What if ______ happens? It’s too risky; I need to be careful; I don’t do that sort of thing; (FEAR = False Evidence Appearing Real); stuckness. It’s not my fault; they did it to me; I need to get even; I’m better than s/he is; why is everyone else so much luckier than me? Complaints; blame things or people outside me; victim/retribution. I need to prove myself, justifications. Fulfillment/values—who do you want to be? Guided meditations, non-traditional methodologies such as Tarot, Numerology etc. If the Seven Levels of Effectiveness intrigue you and yo’d like to learn more about recognizing them, understanding what is happening in the brain at every level, and innovative tools for shifting to higher levels, please join us for our Advanced Coaching Series—Neuroscience, Consciousness, and Transformational Coaching, open to all experienced coaches. We’re lucky that while there is much we still don’t know about the brain, there are a few things that are now pretty clear, and which seem to correlate well with the expansion of consciousness: the basic limbic response of “fight or flight” and the role, dominance and ultimate integration of the two hemispheres of the brain. Let’s look at how things seem to play out at the different Levels of Effectiveness. In the first three levels, our strongly ingrained fight-flight-freeze response dominates. One of the oldest parts of our brain, the limbic system, governs this response. Below the line, when a challenging or negative stimulus comes at us, the brain’s relay center sends messages very quickly to the amygdala, whose job it is to react to perceived threats. (See The Whoosh for more on this phenomenon). The more below the line we are, the more quickly the message gets to the amygdala, causing a fight, flight, or freeze response, depending on the dominant level of consciousness. The levels increase in energy from one to seven, and here we see this play out in the brain. In the level of Hopelessness, there is very little energy or feeling of efficacy in life, thus the response is often to freeze, to feel overwhelmed, to be unable to cope and therefor shut down. In the level of Fear there is an increase in energy; enough to flee, to find a way to escape the threat, to put up protective barriers and defend oneself. In Frustration, energy increases even more, giving us enough to desire to fight back, to go on the offensive, to attack. The brain below the line is quickly reactive, and thoughtfulness, rationality, and accurate assessment of “friend or foe” are in short supply. The higher brain, the Pre-Frontal Cortex (PFC), will eventually receive information and come on line to assess the situation, but often long after damage has been done from the amygdala-ruled reactive state. As consciousness increases, the amygdala is still in operation, but the signal to the PFC seems to speed up as well. The PFC helps us assess, plan, and think long term, and when it comes online, chemicals are released that help calm down the fight-flight-freeze reaction. From the levels of Courage and above, the speed at which the PFC is engaged when a limbic response has occurred continues to increase as consciousness itself increases. We may react, but our higher selves will move us toward apology, waiting until we are calm to respond, taking the other person’s point of view, and increasingly simply noticing our reaction as human and letting it go. In working with this model for the past ten years, we have seen that the gap between automatic reaction and thoughtful response simply gets narrower and narrower as consciousness increases. This means there is less and less clean up to do, less time wasted in blame, and overall, dramatically increased effectiveness. Not only does this (hopefully) seem intuitively correct, it fits with Daniel Goleman’s wonderful work on Emotional Intelligence and its critical role in effectiveness in life. Just what the two hemispheres of the brain “do” is a highly debated, very contentious area of neuroscience. It seems that the best current thinking points us not to the what, but to the how of the way these distinct parts of our brain operate. And this is, to me, most helpful to understanding their importance from the perspective of consciousness: how the different parts of our brain see the world. The Right Hemisphere (RH) holds a holistic view. It understands context and meaning, and the parts of us that experience empathy and most emotions (except, notably, anger) live here. At its furthest over-calibration, it is the energy of chaos, of everything at once and nothing distinct. The Left Hemisphere (LH), by contrast, cares about the individual part and not the whole. It can take something from the totality and bring it into focus to be dealt with. The parts of us that experience the desire to compete, to distinguish ourselves, and to focus intently live here. At its furthest over-calibration, it is the energy of rigidity, of the desire to control things and reduce everything to simple, understandable parts. In addition, hemisphere dominance changes the more one increases consciousness. The LH is traditionally considered the more valuable hemisphere, for its drive, competitiveness and ability to focus. The empathy and holistic view of the RH have traditionally been considered a bit “soft.” It is, however, only by allowing the RH to take the lead, to chart the course, and to set priorities for one’s life such as connection, inclusiveness, love and oneness that the highest levels of consciousness become possible. Thank you for reading Part Two of Consciousness and the Brain. It is a limited and very incomplete overview of what we at BEabove Leadership think may be happening as we grow, develop and transform. Stay tuned for Part Three—Coaching at the Different Levels of Consciousness. BEabove Leadership is now offering the Advanced Coaching Series—Neuroscience, Consciousness, and Transformational Coaching. Available to all experienced coaches, registration is open for classes in Minneapolis in August 2012, San Francisco in September 2012, and a residential intensive in Pennsylvania in November 2012. Something not everyone knows: I’m not as much of a neuroscience geek as I might appear. While of course I am fascinated by the brain in all its endless complexity, I was drawn to this area of study because I have a deep and abiding passion for human transformation. That’s what ultimately drives and motivates me, and my secret project is to map brain changes at different levels of human consciousness. Of course, to do so, one has to believe there are different levels of human consciousness. In traditional neuroscience, however, they are still trying to figure out if consciousness exists at all, and if so, where it can be found in the brain. It’s a complex set of questions that philosophers and theologians (and now neuroscientists) have debated for all of recorded history. Interesting, but ultimately not a particularly compelling area of inquiry to me. I know it’s not very scientific, but I myself don’t have any question that we are conscious, even if the jury is still out on the absolute proof of the matter. My work over the past 30 years (yes, I literally did start when I was 18) as a spiritual student, teacher, coach, mentor and guide has pointed in what is a much more fulfilling direction: not whether we are conscious, but how conscious we are. About ten years ago my studies led me to a fascinating man named Dr. David Hawkins, and a book called Power vs. Force. In this book, Dr. Hawkins provides a research-based view of consciousness, using an exponential scale of 1-1000. It’s powerful, life-changing work, providing an astonishing overview of what it means to be human. For almost ten years my business partner, Ursula Pottinga, and I have been working with, exploring, and building on Dr. Hawkins’ work. We’ve found that having a map of consciousness is not only helpful, but actually critically important for optimizing coaching and organizational development effectiveness. A few years ago, we took Dr. Hawkins’ original work and both simplified and expanded it to a personal and organizational development context. 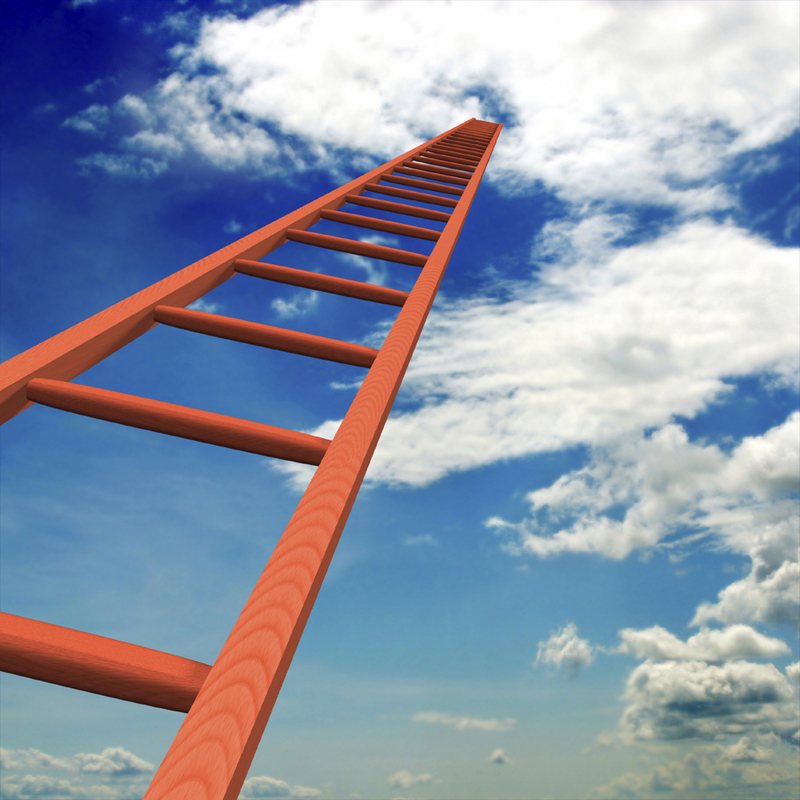 BEabove Leadership’s Seven Levels of Effectiveness provide a road map for both knowing where you are and where you want to go. Not in terms of goals and accomplishments, but as your fundamental beingness in the world. They’ve also given me a powerful challenge. Even though I’ve dodged the question of whether or not science can prove consciousness, that duck and dive is atypical for me. I want to be able to explain, to map out, to prove everything. So, if it is true that we do exist at varying levels of consciousness, I want to know what’s going on in the brain and the body along the way. If our model (and Dr. Hawkins, and many many others) is right, we know people act and react in dramatically different ways depending on their core vibrational state. My neuroscience studies have so far pointed in some really interesting directions, having to do with the calming of the limbic system as consciousness increases and the integration of the right and left hemisphere. Stay tuned for Part Two of this three-part series: our preliminary understanding of how the brain changes at different levels of consciousness, and Part Three, how to work with the levels effectively as a coach or leader.